April Autism Monthly Spotlight - Meet Hugh! We’d like you to meet Hugh Haberkorn: Huey is one of eleven. He is 4 years old and he has Autism. He entered the world a healthy perfect baby boy. In his 1st year, Huey was nothing but smiles, learning to crawl, walk, talk and meeting all the benchmarks and milestones. Between 15 and 17 months his vocabulary had already exploded. He was mimicking and repeating anything and everything he would hear. He was learning to count, was calling out his siblings names, even the dogs. He was labeling many different objects, cookie, baba, cracker, bye-bye, up, no, etc. What I remember most was him saying “mama or mom” what felt like 50 times a day. Up until then, we never had any reason for concern with any developmental or speech issues. I actually felt he was ahead of the game for his age, but not surprised as he had so much encouragement from his nine other siblings that adored him. It was right about 18 months, we noticed a significant decrease in his vocabulary and other concerning signs. He became very disconnected and disengaged and now made very little eye contact when spoken to. He often played by himself and did many things repetitively or stacked and lined his toys. We also noticed a new movement with his hands, waving and “flapping” them. His disposition had changed dramatically in a very short time. Our once very happy baby/little boy was now crying often and easily frustrated resulting in him banging his head on walls and the floor. Shortly after he turned two, not only was there no new vocabulary, but anything he learned and said prior was now nonexistent. Hugh was completely non-verbal. 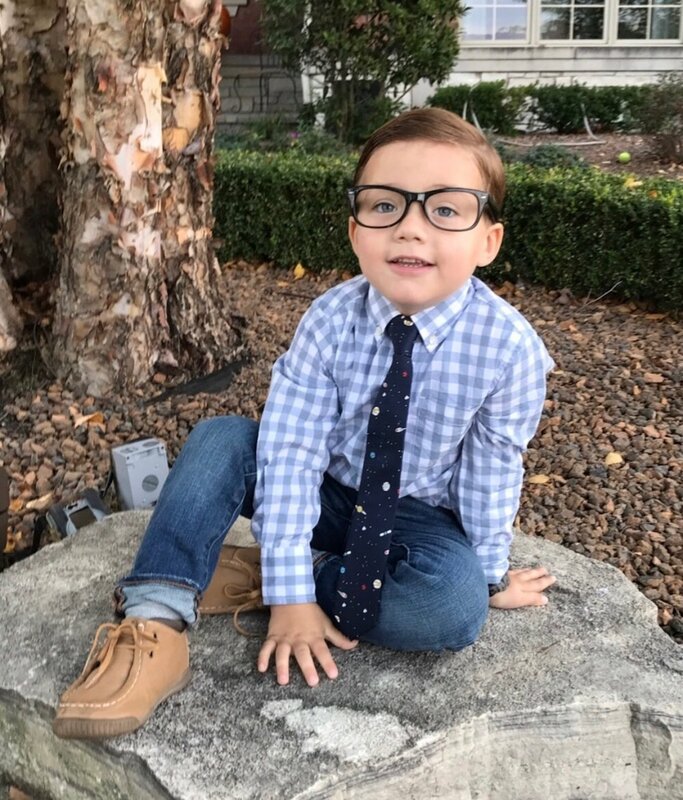 His pediatrician initially advised us to give it a little time, as he thought it to possibly be some sort of regression and adjustment as we had just had our 11th baby when Hugh was 17 months. Days, weeks and months were passing and it felt like someone came in and took a piece of our baby boy away. We missed hearing his sweet little voice and it felt like forever since I heard him call out “mama”. In the months following, we had him in to see several doctors and specialists, from developmental doctors to pediatric neurologists to geneticists and audiologists. This also meant a series of tests and short hospital stays. He spent many long mornings at The Erikson Institute for multiple and very lengthy developmental, behavioral and speech evaluations. As some things were being ruled out, it was becoming more clear to me the diagnosis we were about to receive. On March 20th 2017, one day before Hugh’s 3rd birthday we received an official diagnosis. Hugh was Autistic, a level they told us was the highest on the spectrum. I knew it was coming, but nothing could have prepared me to hear the words that day in the office. Feeling overcome with emotions, I sat there for 15 minutes and cried. All I could think was “what does this even mean, how can we help him, how do we “fix” this….what was next for our Hugh”? I had so many questions. I realized I knew very little about Autism. How could I not know anything about it when its been all around us for years. This was very unfamiliar territory for us. I actually felt a great deal of guilt for having no knowledge or understanding of any of it. Our second son Noah, a twin was born with cerebral palsy, so facing challenges raising a child with a disability would not be anything new to us. It was now the beginning of our new journey with Hugh and we were ready. I was on a mission to educate myself. I got my hands on anything and everything I could read or research to learn about this new frontier we were facing to develop a better understanding of ASD. The next step was setting up a plan for Hugh to get him all of the resources we could to make sure he could have the best possible future. This became my new full time job. After interviewing several schools we felt the best program and fit for Hugh was at Cherry Hill. He started immediately in the full day most extensive program receiving the highest level of services and resources provided, including speech, developmental , occupational and ABA therapy. In addition Hugh also started private therapy outside of school getting additional speech, occupational and OT (behavioral) therapy. Huey was a very busy little guy and his days became very long and very different from anything he knew. It was now Hugh’s new full time job too. His voice was in there. He had a lot to say…this we knew for sure. We were determined to find it again. In the meantime we continued to teach him all the things we would have anyway, praying he was taking it in. The alphabet, counting higher, spelling his name, shapes, colors, animals, and their sounds and constantly encouraging new words. He couldn't talk, but I believed he was listening. This past year Hugh has worked so hard and has already come so far, It has been amazing to watch his growth, development and progress. Our Hugh is talking again and surprises us every day with something new. His voice may have disappeared for 18 long months, but his ability to retain, absorb and comprehend everything he was hearing or being taught was always there. His 10 brothers and sisters have been a constant source of love, support and encouragement. We know they will always be a positive influence and role model to Hugh. We will continue to see that Hugh gets everything he needs to live the best, happy life he deserves. After all it is not just Hugh who is learning something new everyday, but even more what he has taught all of us in the last 18 months. He has his own unique way of communicating and seeing the world, but he is exactly who he is supposed to be. The “how we got here and the why’s” no longer matter. He is the piece of the puzzle our family was missing and he is perfect. As a family, we will continue to raise awareness, understanding and acceptance for all those young and older living with autism to make the world a better place for them. Keep shining BLUE Hugh….until all the pieces fit.